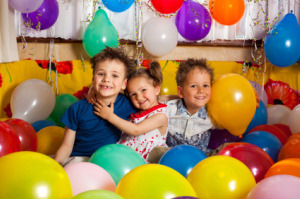 Kids Birthday Party Ideas - isn't it great to see them delighted? We've had some great kids birthday party ideas at our house. The most memorable were probably the cheapest! My kids say it's who is there that's more important to them. So plan ahead, announce it in plenty of time so every-one can come. If you're a working mum like me, you want most the most fun/least hassle theory. Home or Away? Home's undeniably cheaper, but probably most stressful! In our experience some of the best kids birthday party ideas have always been at home, the extra effort has been worth it. 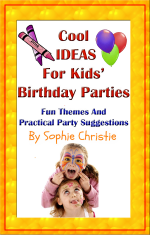 Don't be stuck for kids birthday party ideas. Sign up to my newsletter Full of birthday tips and ideas and receive 101 birthday ideas absolutely free! It's fun to base the party round a theme, which is often quite easy to do, favourite children's character or sport. Posh Party Box provide a one stop shop for party planning. Their unique party boxes come in a wide variety of themes. The party box contains everything you need for a party. For example the Safari Party Box includes invitations, thank you cards, party hats, party horns, animal blowouts, table ware, Multi-color balloons, safari animal puppets on a stick, monkey birthday garland. My son Fraser's 10th birthday party was great fun. Despite it being December we managed to have most of it outside. Apple bobbing (not my idea but theirs! )was a huge hit. I set up a table, bowl of water, bags of apples and lots of towels. The hilarity they had at watching each other getting soaked!! That was followed by a (very loud!) game of football, and a complaint from the next door neighbour (whoops!). I then fed them with hot dogs. As he gets older birthday party ideas for boys gets a litle tougher. However a recent paintball party was a resounding success. Party bags, don't you just hate them? But kids do expect them and I hate to disapoint. But at least they can work for them....I hid lots of penny sweets and chocolate coins in the garden, gave them an empty bag each and sent them out searching. It took a good twenty minutes to find them all and they had a good time doing it. Kids birthday party ideas need not be expensive. Birthday party games are enjoyed less as they get older, however younger children need more organising. Sleeping lions was always one of their (and my)favourites. Ask them all to lie on the floor and stay perfectly still and quiet. The winner is the last one to move or make a noise, how great is that!! No happy birthday is complete without a birthday cake, mine are always home-made birthday cakes for kids. Well...to be honest(! )...if I don't have the time to make one from scratch then I decorate a plain shop bought one. Or for something different you could try an ice-cream cake. No cake is complete without candles, have you seen the sparklers and mini flame throwers available in the shops now? They certainly make the party go with a bang! Again I've built a separate page for kids birthday cakes. Memorable 5th Birthday Party Ideas If you're searching for 5th birthday party ideas check this out for the best birthday party ideas.